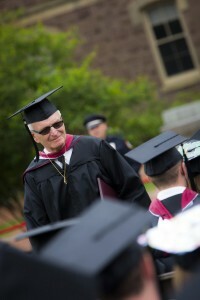 In May 1966, J. Ronald “Bud” Martin graduated from Lafayette with a degree in chemical engineering. On Saturday, exactly 50 years later, he got another Lafayette degree, this time in music. Bud Martin makes his way to the stage to collect his second Lafayette diploma. After his first Lafayette graduation, Bud earned his PhD from Princeton and then worked in research for five years. He was hired by Lafayette in 1976 and taught chemical and biomolecular engineering for 36 years. He retired in 2012, but started taking music courses the year before he retired. “I always loved music, and I’ve been a church organist for many years” says Martin, who began playing the piano in third grade and the organ in high school. He decided “to hold my own feet to the fire” by taking the courses for credit rather than auditing them. Fortunately, he says, the College didn’t make him take math and chemistry again — although he did have to take some requirements again, including a year of Spanish which wasn’t a requirement the first time around. Ironically, he also took an Aging Studies class with Jamila Bookwala, professor of psychology.